Dandelife is billed as a social biography site (a more specialized version of a social network) . As I've blogged previously, these specialized social networks offer features that more general networks don't possess, and they have a comparative advantage in attracting and retaining users who belong to the targeted niche group. I like Dandelife. It has a lot of potential since it gives users an easy route to self-expression, which most people cherish. You don't just post on topics of the day, but delve into your past to share more personal and personally important moments in your life. I think that autobiographical aspect has a lot of appeal. 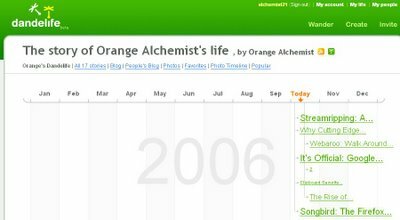 Stories are arranged in a timeline, and Flickr photos and YouTube videos can be incorporated as well. If you want, you can import your TypePad entries or any RSS feed. There could be an opportunity to offer users a bound copy of their posts (like a blog-to-book service) since these posts will be more meaningful to users than the more ephemeral topics that bloggers usually post about. If nothing else, Dandelife offers a convenient way to generate a timeline with the highlights of your life. You could even chart historical events on there that have nothing to do with you. Or a writer setting up the backstory of a fictional universe could use it to keep a neat copy of major events that occurred in that world. On a side note, the CAPTCHA that I had to complete to register was one of the longest I've seen (10 characters). Thanks for the positive review of Dandelife. I appreciate the feedback. It'd be nice to see a dandelife badge on your site here too!